Last Sunday, 22 August, more than 2000 people gathered in Moscow's Pushkin Square to protest the building of a motorway through a protected forest in the northwestern Moscow suburb of Khimki. For months local ecologists have been appealing to Moscow authorities and the Kremlin to change the motorway route and save the endangered natural environment. After the Sunday meeting there was to have been a concert by musicians supporting the protesters. The concert was banned by the Moscow authorities who did not allow the musicians to set up their electronic equipment. Veteran rock musician Yury Shevchuk, lead singer of the rock band DDT and well known for his support of human rights and free speech, nevertheless sang songs without a microphone and strummed an acoustic guitar. He told the crowd he was taking part in the protest because nature in Russia is dying. "We musicians wanted to put on a concert to defend nature, the fields, forests and Lake Baikal. Khimki forest has become a symbol for everyone," Shevchuk said. Shevchuk made waves in May when he took part in a meeting with Prime Minister Vladimir Putin. He openly challenged the country's authoritarian leader, saying demonstrations in Russia are broken up by "repressive" security services. Following the Aug. 22 Moscow meeting, openDemocracy Russia is bringing back two of its old articles: one written by Elena Chirikova, the leader of the Khimki forest movement, and the second giving an account of Yuri Shevchuk's meeting with Vladimir Putin. Passions have been running high in recent years among residents of Moscow and the Moscow Oblast over the issue of the new Moscow-St. Petersburg motorway. This is scheduled to divide the Khimki Forest Park in half in the section from the Moscow ring road to Sheremetevo airport. People have linked this issue with the attempt on the life of the journalist Mikhail Beketov in 2008, as well as the scandalous election campaign in Khimki in 2009 and the numerous clashes between residents and the authorities. New groups are constantly joining the conflict on both sides. Initially, it was a conflict between the Moscow Oblast authorities and the Transport Ministry on the one side, and the residents of the Khimki city district and the north of Moscow on the other. Now the conflict has drawn in such forces as Prime Minister Putin, the European Bank of Reconstruction and Development, the Moscow city government, Greenpeace, the European Parliament, the European Green Party and dozens of ecological organizations both inside Russia and beyond. How is it that a seemingly local conflict has not only remained unsolved after all these years but has, on the contrary, become a federal problem and is now a subject for international discussion? The idea of building a new motorway connecting the two Russian capitals was first discussed at the Transport Ministry in 2004. A document was published which outlined the route, but also contained all the “mines” which subsequently began “exploding”. Within Moscow the route follows the October railway line. But after it crosses the Ring Road it suddenly takes a sharp turn to the northeast, passing through the middle of Khimki Forest Park. Deviating to such an extent that it goes close by Sheremetevo international airport, the road then returns to a direct route and back to the October railway. The resulting “loop” has a much greater radius than would be required simply to bypass the town of Khimki. This decision means that the territory of the Khimki Forest Park (which already stretches towards Sheremetevo), is cut in half. Ecologists believe this will lead to the destruction of an eco-system that is unique for the area near Moscow (centuries-old oak forests, elks, boars and many species of birds). Furthermore, the decision will destroy a site of special scientific interest, the mesotrophic cranberry swamp in the Khimki forest and the floodplain of the Klyazma River, which is in its original state only in this area. There are possible alternatives to this route, but it is unlikely that they were seriously considered. Secrecy is the most characteristic feature of this project. The route was officially selected by Khimki mayor Victor Strelchenko in 2006 from the three which to some extent or another affect the Forest Park. This one was the worst of the three for its influence on the eco-system. The route was selected before the “public hearings”, which were therefore no more than an empty formality. Other alternatives are also mentioned in subsequent replies from the Transport Ministry to inquiries from local residents, including a flyover over the existing Leningrad Highway, a tunnel under the forest etc. There were, however, no representations for or against any of the schemes. The most obvious option – that the road should follow the October railway line, as planned in Moscow – is not even mentioned. It is, therefore, probably correct to say that having the motorway cut through the middle of the forest was planned from the beginning, at the level of undocumented decisions that were made “behind the scenes”. At this stage, there was no reaction from residents of Moscow and the Oblast, simply because the information was only available to a select few. Most of us are not very likely to start the day by looking the Transport Ministry website. As for the “public hearings”, at local authority level every possible effort was made to conceal the information: the announcement was printed in small print in a local newspaper next to the advertisements for fortune-telling; there was no mention of the Khimki Forest Park or the Moscow-Petersburg motorway! Nevertheless, the State Forestry Service, although severely shaken up in the 1990s, was still functioning. Its reaction to the project was swift and negative. Gadzhi Alimusaev, head of Krasnogorsk Specialised Forestry Management (which at the time included the Khimki Forest park), even refused to sign the document confirming the pre-selection of the area for construction. The head of Moscow Directorate of Forest Management, Mrs. Kuznetsova, also refused to agree to the project. She gave her reasons as follows: “The planned route of the motorway will maximally encroach on forest lands. /…/ Extensive deforestation and division of the forest into separate parts will disturb the trees and plants on both sides of the motorway and lead to their degradation, so project construction will be very damaging to the forest /…/. An examination of the motorway route through the forest shows that the authors of the planning decision made no attempt to reduce possible damage to the Forest Park. For these reasons the Directorate categorically refuses its consent for this scheme”. But it was already 2006. The State Forestry Service was effectively destroyed (a suspicious coincidence? ), when the new Forestry Code was adopted and forest conservation was transferred to the jurisdiction of the Agriculture Ministry. Forestry workers suddenly became much more amenable. The fact that, despite such serious objections, the decision was taken to build the motorway through the middle of the Forest Park, is evidence that there must be serious financial interests behind this option. What are these interests? Firstly, there are the interests of the Transport Ministry and the “non-commercial organisation”, which it has spawned. The company is called Avtodor and it combines the functions of a government agency and a business. The project is planned as the first large-scale public-private partnership with the involvement of western investors – the EBRD and European Investment Bank. The intermediary link will be the North-West Investment Company, backed by the French firms Vinci and Eurovia, who have extensive experience of attracting European investments. The plan is that in the future the road will come under the control of Avtodor – although the Russian financial contribution is quite modest (no more than a third of the costs, with Vneshtorgbank as the probable Russian investor). The use of forestry lands (which is against the law, but made possible by the way things are done in Russia) is de facto a concealed investment in the project by Avtodor. Indeed, the use of these lands will obviate the need for complex technical solutions (tunnels, flyovers) and ensure that the project is maximally simple and low-cost. Furthermore, taking the road through the forest avoids numerous property disputes with landowners on the route of the motorway. The project is federal, and so is the forest – so one “agreement” at the very top should be sufficient, doubtless a factor in the considerations of the people taking the decision. In documents published before the fracas began, transport engineers were gloating over how neatly the highway avoids any buildings and facilities. We should note that these facilities include, for example, the Khimki municipal solid waste landfill site – a mountain of rubbish the size of a 7-storey building on the left bank of the Moscow Canal. Reclamation of the landfill site would have meant a significant increase in project costs. The public was for some time unaware that, by neatly bypassing the landfill site, the motorway will destroy a green zone several hundreds of metres wide, which at present is the only protection for residents of nearby apartment buildings from this horrible rubbish dump. Secondly, the selected motorway route will provide maximum opportunities for the commercial “development” of forestry lands on both sides of the highway by organisations that are close to the Moscow Oblast authorities. This is probably the main reason for the touching unanimity of transport engineers and authorities on all issues connected with the motorway. It is clear that the potential revenue from the operation of the plots of land adjacent to the motorway that links the two capitals, and also the international airport, could exceed the revenues from the operation of the motorway itself. This would, of course, be illegal, but in the Moscow Oblast illegal seizure of land is perhaps the most common crime in this area of the law. Initially this was discussed almost openly - possible revenues from the road infrastructure were cited by transport engineers as one of the ways to increase the investment attractiveness of the project. 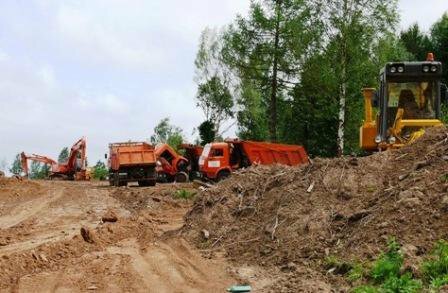 The governor of the Moscow Oblast, Boris Gromov, in his decree №358/16 reserved practically the entire territory of the Forest Park for “major construction projects and transport infrastructure”. It’s true that under pressure from society, this decree was subsequently annulled, but the local authorities have not abandoned their plans. This can be seen from the Area Planning Scheme of the Moscow Regional Directorate for Architecture and Urban Development, where the Khimki forest is still shown as a “zone of concentrated urban development activity”. Thirdly, there are the interests of a group that controls Sheremetevo airport. For them the closer the motorway comes to the airport, the better, as it means they don’t have to build an additional access road. But this solution is of dubious value, as it lengthens the route for the main transport flow. The present transport minister Igor Levitin holds key positions in the management of both Sheremetevo airport and Aeroflot, which is based there, so there is little chance that transport engineers will be able to give the matter their objective consideration. The battle for Khimki forest – first phase. So the project lobbyists are motivated by very serious commercial interests. Who opposes them, and why? First of all, the local residents, whose anger is easy to understand. Khimki is a polluted industrial district, with such giants of the defence industry on its territory as Energomash and Fakel. We have already discussed the landfill site. Additionally, there is the existing Leningrad Highway and the Moscow ring road. “Infill construction” is depriving residents of most of the city’s green zones – so the Khimki Forest Park is effectively becoming the only place where the natural environment is preserved. For pensioners and families with children it represents the only chance to enjoy nature every day. It’s hardly surprising that the motorway project, which will destroy the only forestry park and which will also pass by houses in the most polluted city area (next to the landfill site), has not met with approval. Residents were informed out of the blue – they only found about the project when the main decisions had been taken, and surveying work had begun in the Forest Park. The first reaction to the shock was clashes between surveyors and residents – there were even reports of people setting their dogs on the surveyors. But despite individual incidents, the residents generally behaved in a civilized manner. The informal movement “Eco-defence” was created and signatures were collected for an appeal calling on then-president Putin to protect the forest. 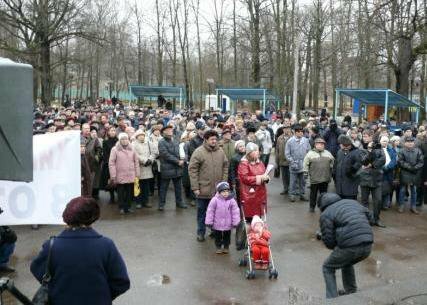 There were officially-approved meetings calling for the protection of the Khimki forest and the site www.ecmo.ru was created, which provides up-to-date information on the conflict. The local opposition newspaper, Khimki Pravda, published by journalist Mikhail Beketov, ran articles revealing the project as an excuse for the illegal seizure of forestry lands. Initially it was a local conflict – the battle was waged between local residents and the authorities of the urban district of Khimki and the Moscow Oblast. At the beginning the federal authorities (including the Transport Ministry) distanced themselves from the problem. Indeed, all the documents (order 367-R by Strelchenko and Decree 358/16 by Gromov) relating to the route through the territory of the Forest Park were signed at local level. As happened in Soviet times, all the residents’ appeals, including appeals to the Russian President, were sent to the local authorities. A little later, residents received support from the Moscow City Duma, the Moscow City Natural Resources department, the Communist party and Yabloko – which is quite natural in a situation involving the planned destruction of the “green lungs” in the north of Moscow. The actions of the “Gromov team” were hardly appropriate to the situation – there were attempts to ban meetings and harassing activists. In one instance the Khimki police fined a young man who was handing out invitations to the OFFICIAL public hearing about the widening of the Businovskaya junction – the starting point of the motorway construction. The hearings themselves (attended by about 500 locals) were turned into a sham by the authorities, who closed them as soon as the discussion began and didn’t even try to organize anything resembling a dialogue. This only made the protesters angrier. The situation became much more serious after the attempted murder of Mikhail Beketov in November 2008. Although there are so far no official results of the investigation, many Khimki residents have no doubt that the local authorities were involved in the attack. The battle reached its apotheosis with the campaign for the Khimki mayoral elections in 2009: despite the fact that mayor Strelchenko managed to stay in power, ecologists believe that they did achieve their main goal. During the election campaign Strelchenko had to cancel order 357-R approving the scheme for the route through the middle of the forest. And Gromov’s decree 358/16 soon faced a similar fate – it was cancelled several weeks after the ecologists went to court. 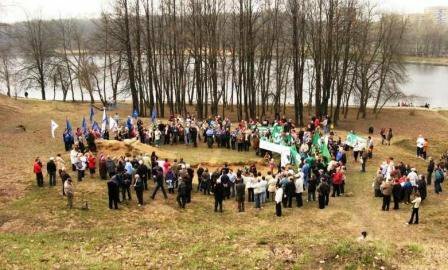 The victory of the Khimki ecologists in early 2009 put project supporters in an awkward position. On the one hand, the project was practically ready and talks with European investors had entered their final phase. On the other hand, the project still had no documents legalizing the land acquisition, which is in direct contravention of existing legislation. Public opinion increasingly tended to side with the ecologists, who had the support of many ecological and human rights organizations. Additionally, the Khimki ecologists managed to get the ear of the European investors. At a meeting between the “Greens” and representatives of the EBRD board, the directors showed serious interest in the problem, and even promised to initiate their own, independent assessment process of alternative schemes for the motorway route, with independent expert examinations and public hearings. Two options were available for the lobbyists. The first was to comply with the ecologists’ legitimate demands and seek a compromise. This would have entailed a review of the project and reduced the profits. The second was the use of “heavy artillery” to crush the opposition and take the heat off the European investors. They are actually the weakest link in the whole project: the European Union traditionally pays particular attention to environmental issues, and the work of such organizations is monitored much more closely than it is in Russia. But if the investors withdraw, at least two thirds of the project finance goes with them and in the current economic climate this will make the project unviable. Be that as it may, the second option was chosen and in the first half of 2009 the first legislative steps were taken. Article 86 of the Forestry Code categorically forbids any change of use for forestry parkland, but without it the construction is illegal. This means that the planners have spent several years working on a project that a priori did not comply with legal requirements. Of course, the project documentation (and the environmental impact assessment) sidesteps in every possible way the issue of the status of the Khimki Forest Park land: it is described as “protective forest” or “water conservation zone”. But you can’t hide the obvious and the status of the land was ultimately established. When it was clear that the defenders of the forest were legally unassailable, governor Gromov was forced to cancel his decree. There are precedents for violations of Article 86. President Putin’s instruction of 12 June 2008 N 850-r resulted in part of the Sheremetevo Forest Park being converted to transport land for the construction of the railway line to Sheremetevo. In the case of the Khimki forest, however, public reaction would have been so strong that the Prime Minister would have come under fire. Therefore, under the guise of insignificant changes connected with “timber procurement”, the Forestry Code was “amended” in 2009 and Article 86 simply disappeared. But there were other restrictions: Article 11 of the Federal Law №172-FZ forbids change of use for forest land if alternative sites can be found for capital construction projects. The Transport Ministry would naturally have sworn that there were no alternatives, but there had been a mix-up: deputy minister of transport Oleg Belozerov had himself admitted in an official letter the year before that other options existed. This lack of coordination shows that the masterminds behind the project probably had to do things in a hurry. The developing situation meant that they were under pressure and unable to work to their carefully prepared plan. 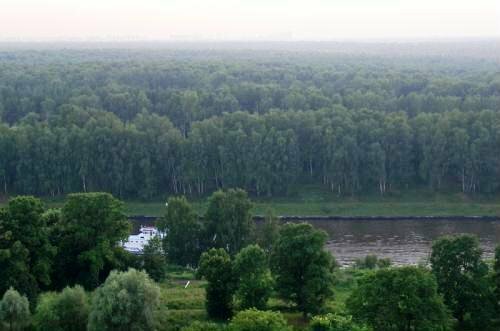 In spite of continuing legal discrepancies, the next step was taken in November 2009: Putin signed Instruction № 1642, according to which parcels of land in the centre of Khimki Forest Park will in fact be converted to land for transport. It is hard to say what arguments forced him to take such a questionable decision. It should be noted in passing that this is not the only case of the Prime Minister hiding behind his high approval rating to promote projects that are harmful for the environment and based on a concept of economic development relying on raw materials. The Baikal Paper Mill scandal was the most recent example. Physics teaches us the principle of action and reaction, which is applicable to this case too. Such an obvious and major attack on environmental legislation and the “green” movement could not help but draw a reaction from civil society, both in Russia and outside it. It’s clear that the problem is not restricted to the Khimki forest alone. It is only a testing ground for the fine-tuning of methods for the commercial development of conservation areas. It was at this time, for instance, that the outline plans of the Central Ring Road were being developed: the plans are to use a similar technique to “develop” over 100,000 hectares of forests near Moscow. It cannot be ruled out that supporters of the project might try to complete the stage of the project requiring the use of force. This resulted in a direct approach from Greenpeace and the Russian WWF to potential investors in the project. They also appealed to the European Green Party to drop its participation in the project, if the scheme for the motorway to go round Khimki Forest Park is not selected. The appeal did not go unanswered – at the instigation of the European Green Party, the European Parliament passed a resolution warning European investors that participation in the project would be unacceptable. The international organization Bankwatch, which monitors observance of the law in the investment activities of EU banks, began to keep close track of developments. Even the French Senate became involved – Senator and former French ecology minister Dominique Voynet personally warned the Vinci company that it was unacceptable to take part in a project that destroyed the environment. It is worth noting that the Russian Duma is evidently less concerned about the problem than the French Senate. But this year more than 40 ecological organizations from Russia and the CIS have already made the same request to potential investors – to abandon participation in the project until the Khimki forest is safe. The Khimki defenders of the forest also have no intention of giving up. They have already filed a case to the Supreme Court demanding that Putin’s decree № 1642 be declared illegal. The first court hearing will be held in March. They plan to send an appeal to foreign ecological organizations, requesting them to join the campaign to put pressure on the European investors. We have unfortunately to admit that we have so far not managed constructive resolutions of environmental conflicts between the authorities and the oligarchs on the one hand and civil society on the other. It is quite obvious what lobbyists for the project are counting on: general passivity towards issues not directly affecting either people’s housing or their income. In other words, relatively “light” measures e.g. buying off, intimidating and perhaps arresting quite a small number of activists could be used to force the project through without causing a large public outcry. They have evidently also calculated that the attractiveness of investing in the project (achieved, as we recall, by using forest territories that “belong to no one”) might outweigh the possible image risks for European bankers. It cannot be ruled out that supporters of the project might try to complete the stage of the project requiring the use of force – felling trees and overcoming the resistance of local residents – before the European banks are finally brought into the project, thus taking the heat off them. The Greens rely primarily on their European colleagues, Russian civil society and on the active support they get from residents of Moscow and the Oblast. If the residents behave as anticipated, going ahead with the Khimki project could provoke an extremely serious situation. It would be not unlike events at “Rechnik”, only in this case the flags of the defenders of nature and the law will flutter above the heads of local residents. Then project lobbyists really will be in an awkward situation: Western investors will almost certainly withdraw from such a сontroversial project and this would lead to its collapse – in whatever form. In the light of these alternatives, the most sensible thing would be to compromise and come up with another scheme for building the road, even if this leads to a delay of several years. Time will show to what extent the opposing sides are ready to compromise. It has to be said that there are not currently many grounds for optimism. Only one thing is clear: whatever the result of the conflict, the whole affair has grown to such an extent that its consequences will extend far beyond Khimki.